In her everlasting quest to find her prince, this little beauty wonders just how many frogs must she kiss before her dreams come true. 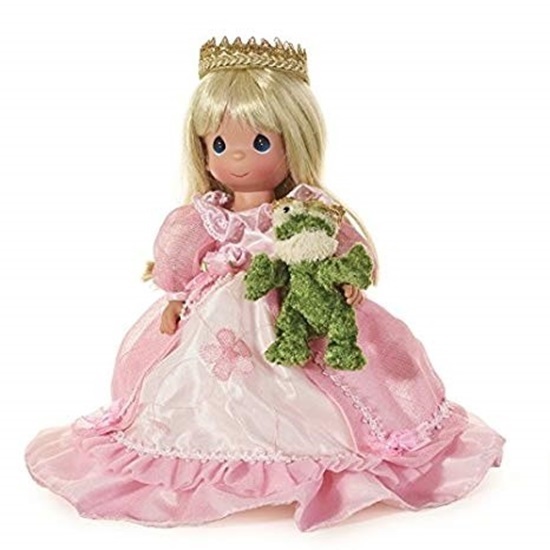 in her beautiful pink gown with matching pink pantaloons and white mary janes she is sure to find her prince. She is 12 inches tall and her head, arms, and legs are jointed. She has blue tear drop shaped painted eyes. Her long blonde haitr flows loosely around her shoulders with a fabric gold crown that sits atop her head. An adorable plush green frog is included. She is perfect for ages 14 and up.